Whether you are a bride or a cowboy (or both! ), BSD can take care of your alterations! 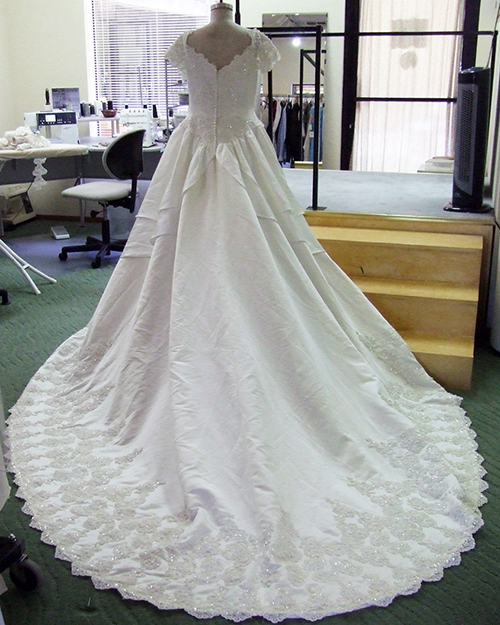 In business for over 30 years, Barbara has worked with more than three decades of bridal fashion. From refitting and restyling vintage dresses to basic alterations on the latest styles, she can do the work you need to make your dress and your day unique. Barbara can also help the entire bridal party with their alterations: dresses for bridesmaids, mothers, and flower girls, as well as last-minute changes on tuxedos for the groomsmen and fathers. “Although my portfolio shows some of the more complex projects I have tackled, I also do the basics: hems, repairs, replacing zippers. I have experience with all men and women’s clothing. I hem and repair jeans; tailor coats and jackets; hem sleeves on blouses and men’s shirts. “I tailored at the Men’s Wearhouse for several years, so I have a LOT of experience with men’s suits and shirts. In fact, many of the men I worked with there followed me when I went out on my own again. “I’ve also done repairs and alterations on ski wear and leather jackets. Zipper replacement is something I do a lot of. Bride Amber thought the huge train on her 1980's vintage dress was a little too plain compared to the heavily jeweled bodice.